People who fall more towards the introvert side of the spectrum get their energy from being by themselves. Alone time is crucial to recharge social batteries, and they prefer smaller groups with deeper connections than their extrovert counterparts. Despite the stereotype of salespeople being cheesy and enthusiastic, introverts are great sales people without facades. Part of what makes them great salespeople is their comfort with silence and their above-par listening skills. This means that they’ll let buyers go on and on, giving them ample information to base a proposal upon. Introverts are also detail-focused so they’ll collect a lot of data before presenting solutions to potential buyers. They come off as thoughtful, thorough and well organized, a trait which charm and impress customers. If you or someone on your team is an introvert, they will need a bit of practice with some actions and attitudes that may come easier to folks who lean towards extroversion. Because introverts tend to be more introspective, they’ll need to practice being assertive and charming. Assertiveness will help them reach out to new buyers or customers and position their solution as the most practical, cheapest or best option on the market. Allowing themselves to wander off tangent will help them create rapport through charm and will enable them to connect to a range of different people when they’d perhaps just want to get in and get out. Extroverts get their energy from being around different people. They crave social contact, new experiences and only need alone time every once in awhile. Their love of people ensures that they connect with people and build rapport quickly. This rapport can make the difference between a buyer that opens up to them honestly about their problems and pain points, which they can use to solve their issues better. Another extrovert strength is their ease of being in control and being assertive. They don’t mind picking up the phone and calling buyers or pushing the conversation towards what they want. They come off as charming, engaging and knowledgeable. People who lean towards extroversion will need to make sure they develop skills that will balance their energy and intensity in social situations. They’ll need to work on their listening skills and must control themselves in order not to dominate conversations. A good exercise for phone conversations is to mute the phone while the buyer is speaking. Keep it muted a second or two after the customer finishes, which will encourage them to keep talking (people hate dead air). Extroverts will also need to stay focused and avoid distractions. 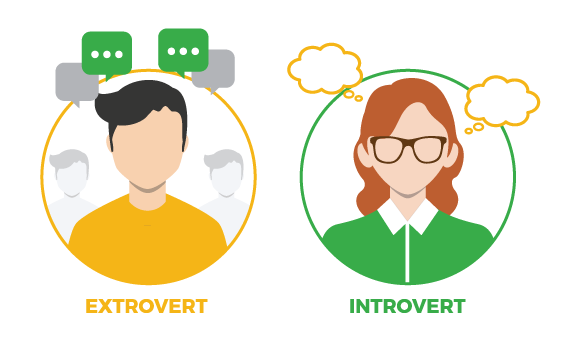 The opportunity to connect with a lot of individuals may distract extroverts so they’ll need to stay organized to avoid dropping people in the middle of the process. A good CRM will be a blessing to keep extroverts organized. It’s common that introverts will often be selling towards extroverts and visa versa so you’ll need to know how to balance the conversation. If you’re an extrovert selling to an introvert, remember to listen and ask lots of open-ended questions to get your introvert buyer to talk. Pay attention to their pain and even let the silence sit in the air to encourage them to talk more. If you’re an introvert selling to an extrovert, keep control of the conversation by practicing assertiveness and guiding the conversation where you need it to go. If your extrovert buyer insists on building rapport before opening up to you, play along and bring it back to your product once you’ve established that connection. The exciting part of sales is finding solutions to problems. When you connect a customer with a product or service that improves their current situation, there’s a lot of satisfaction that isn’t only measured by the commission. To improve your sales techniques, take a look at your personality and the personalities of the people of your team. Train them to identify the personalities of the people they’ll be contacting so that they can connect with people better. Once your staff is aware of different personalities and the ways that different techniques will encourage them or turn them off, you will see an improvement in your sales numbers. Constant training is necessary and will help you and your team not only in sales but also navigating relationships inside and outside the office. We have sales agents to suit every personality!